"Happy" by Pharrell Williams is the kind of catchy song that gets stuck in your mind for hours (or days in my case). You know the song, “(Because I’m happy!) Clap along if you feel like a room without a roof! (Because I’m happy!) Clap along if you feel like happiness is the truth! (Because I’m happy! )…” I've run into a gazillion folks who, like myself, have made this jovial tune their smartphone ringtone so that even on the gloomiest of days each phone call (even the not so great ones) at least start out with a little happiness. All kidding aside I have yet to meet someone who did not long for happiness, even just a little bit, in their lives every day. But each day brings with it its own anxieties and stress. Whether you are a nurse, teacher, hair stylist, dog groomer, judge, or juror, (or all of the above if you’re a mom!) you know all too well how quickly stress can build up and start to wear you down—eroding your happiness. I stumbled onto Happify.com, a great website that uses scientifically designed games and activities to help you build your happiness skills. Happify.com says that 7 out of 10 people say they experience stress every day. Almost 1 in 4 women report feeling extreme stress during the past month (compared to just 1 in 6 men)...not really surprising if you are in the healthcare profession. Work overload, time pressures, sleep deprivation, understaffing….and the list goes on and on….can quickly cause stress levels to skyrocket. How can we bring those stress levels back down to earth? We have to SPRING into action. This spring let's make a few changes in our lives to bring the stress levels down and the shoot the happiness levels through the roof. To help you remember 6 ways to help reduce your stress levels just think S-P-R-I-N-G! Sleep: Sometimes it seems virtually impossible to get enough quality sleep. However, sleep deprivation has been linked to hypertension, increased stress hormone levels, as well as problems with decision making, solving problems, and controlling emotions. A quick 10 minute nap during the day can boost alertness and performance. The National Heart, Lung, and Blood Institute (www.nhlbi.nih.gov) recommends going to bed and waking up at the same time each night if possible. Keep your bedroom cool, quiet, and dark to let your mind know it’s time for sleep (this means put the tablet or smartphone down—it can wait until tomorrow). Prioritize: Keep things in perspective. Prioritizing daily tasks is a major way to gain a measure of control over stress. Make a list of things you have to do for the day and try to do the most unpleasant or difficult tasks first so that as your day progresses the tasks become easier and the day less stressful. Break large tasks into small steps and delegate when you can. Relax: Although you may feel you simply don’t have time to relax, even a 2, 5 or 10 minute relaxation break can help. Take a quiet walk around the building, sit quietly for a few minutes breathing deeply, or listen to your favorite song (how about "Happy"?). Any activity that takes you away from the here and now can help to relax you. Interact: This may sound crazy (it did to me!) but socializing can actually increase the hormone oxytocin that decreases anxiety and make you feel more confident. 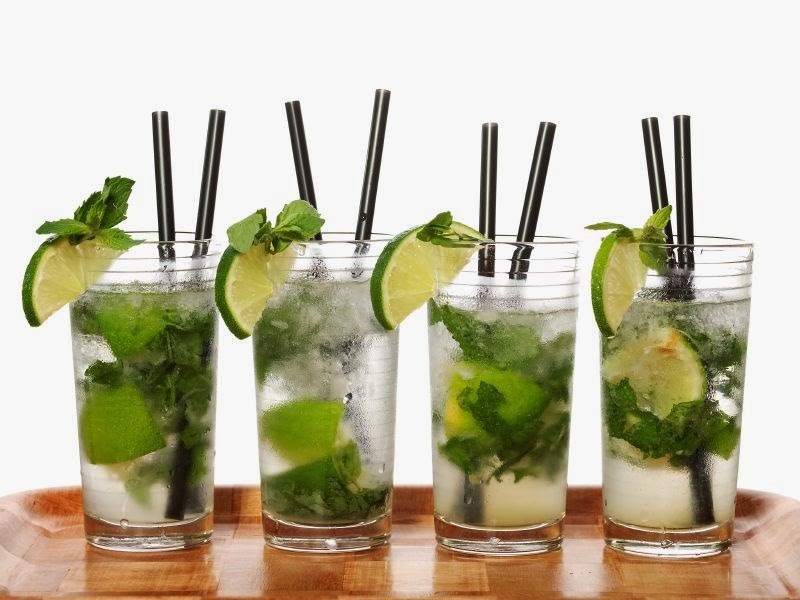 Call up a few friends and share a meal or have a drink (try the oh so yummy Mojito recipe below). Grab your best buddy and go shopping! Staying connected to your friends and family can help you feel supported, stay mentally sharp, and improve your overall sense of self and well being. Nourish: Oranges, tangerines, blueberries, and almonds all work to reduce stress levels and they are easy to stash in a backpack, lunchbox, or pocket. For breakfast start the day with a banana and some yummy yogurt. At lunchtime add avocado to a fresh salad with grilled chicken. For dinner try heart-healthy salmon with nutrient rich carrots on the side. Finally, my two favorite words—Dark Chocolate. Get moving! : Exercise is one of the best ways to relieve stress and feel better quickly. As little as 20-30 minutes of increased activity can go a long way towards reducing stress hormones and increasing the feel good hormones. In fact, several studies have shown that exercise can be as effective as or even more effective than antidepressants and therapy in reducing the stress hormone cortisol. Are you feeling just a little bit happier now? I hope so :-) SPRING into action and reduce your stress today for a happier tomorrow! 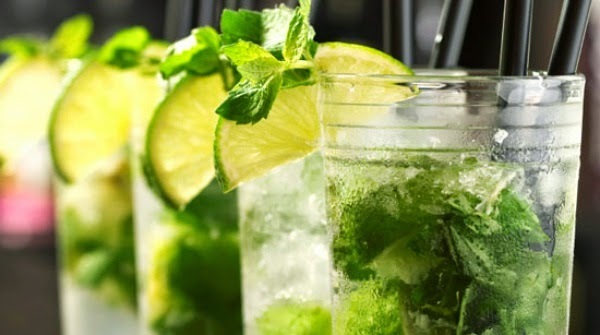 Place the mint leaves into a long mojito glass and squeeze the juice from a cut lime over it (should be about 2 ounces of fresh lime juice). Add the powdered sugar, then gently smash the mint into the lime juice and sugar with a wooden spoon. Add ice (preferably crushed--I'm in love with ice from Sonic) then add the rum and stir, and top off with the club soda. Add sprig of mint for garnish and repeat for your friends and call it a party! Or scale up the recipe to 1 bunch of mint, 1 cup of sugar, juice from 6-8 limes, 1-750 ml bottle of white rum, 1 liter of club soda, and ice. Let the good times roll!